Creativity requires as much practice as any other skill. These quick creativity work-outs will help your students exercise their creative muscles. How many uses can you think of for a spoon? You have two minutes… Go! Developed in the ’60s by psychologist Ellis Paul Torrance, the Torrance Test of Creative Thinking (TTCT) sought to identify a creativity-oriented alternative to IQ testing. One of the most iconic elements of the TTCT was the Incomplete Figure test. 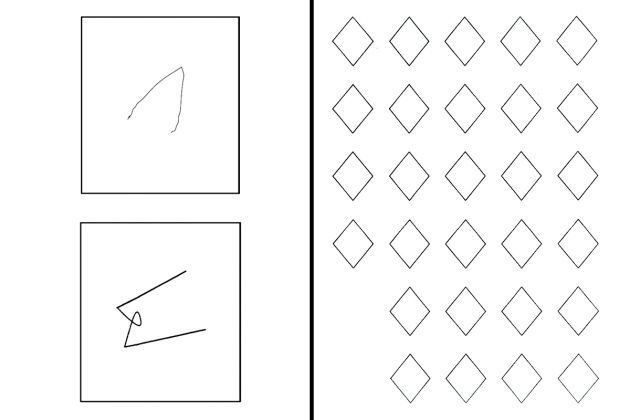 You’re given a shape like the below, and then asked to complete the image. Print out these figures, and give yourself five minutes to see what you can turn them in to. Uncommon subject matter, implied stories, humor, and original perspective all earn high marks. This is a three minute competition. Each student takes a writing utensil and the 30 circles template. Their goal is to make as many images as they can in 3 minutes. For example, a students could add just a few lines to turn a circle into a baseball, or add a stem to make it an apple. The winner is the person who creates the most unique images in three minutes.